by Hartley, Richard D.; Rabe, Gary A.; Champion, Dean J. 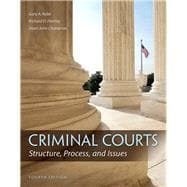 From the actors in the system, including judges, prosecutors, and defense attorneys, through the sentencing and appeals process, Criminal Courts provides comprehensive coverage of the United States Criminal Court systems in a succinct, readable approach. It examines issues confronting the system from historical, philosophical, sociological, and psychological perspectives, and throughout there are comparisons of court ideals with what actually happens in the courts. Comprehensive coverage of the processing of offenders from when they are arrested and charged with crimes, to when they are convicted and sentenced is presented, and throughout the text, practical, real-life applications of the topics and issues give the material meaning. Included to enhance learning are: evidence-based chapter openings that provide context to the chapter’s material, boxes that discuss relevant case law, chapter summaries to reiterate the chapter learning objectives, and policy-oriented critical thinking exercises based on current issues facing the system. Richard D. Hartley is an Associate Professor in the Department of Criminal Justice at the University of Texas-San Antonio where he teaches courses on criminal courts and the administration of justice as well as research design and analysis. He holds a PhD from the School of Criminology and Criminal Justice at the University of Nebraska-Omaha. Dr. Hartley’s research interests focus on decision-making practices in criminal courts. He has been involved with a number of funded research projects including an analysis of decision-making across multiple stages in the federal criminal justice system and a multi-site evaluation of veterans’ treatment courts. He holds professional memberships in the American Society of Criminology, the Academy of Criminal Justice Sciences, the European Society of Criminology, and the Society for Empirical Legal Studies. Some of his recent research appears in Crime & Delinquency, Criminal Justice and Behavior, and Criminal Justice Policy Review. Dean John Champion, deceased (1940-—2009), was Professor of Criminal Justice at several universities including Texas A & M International University, Minot State University, California State University-Long Beach, and the University of Tennessee-Knoxville. He received his PhD from Purdue University and his BS and MA degrees from Brigham Young University. He also completed several years of law school at the Nashville School of Law. Dr. Champion was a prolific writer and has over 40 texts and/or edited works to his credit, a few of which were internationally recognized having been translated into Russian, Portuguese, Chinese, and Spanish. He maintained membership in 11 professional organizations and was a lifetime member of the American Society of Criminology, Academy of Criminal Justice Sciences, and the American Sociological Association. He was a former editor of the Academy of Criminal Justice Sciences/Anderson Publishing Company Series on Issues in Crime and Justice, and the Journal of Crime and Justice, and a contributing author for the Encarta Encyclopedia 2000 for Microsoft. He was also a former Visiting Scholar for the National Center for Juvenile Justice and president of the Midwestern Criminal Justice Association. Some of his published books for Prentice-Hall include Crime Prevention in America (2007); Research Methods for Criminal Justice and Criminology, 3rd Edition (2006); The Juvenile Justice System: Delinquency, Processing, and the Law, 5th Edition(2007); Corrections in the United States: A Contemporary Perspective, 4th Edition(2005); and Probation, Parole, and Community Corrections, 5th Edition (2008). Gary A. Rabe. After serving for five years as the Vice President for Academic Affairs at Minot State University (MSU), Gary Rabe returned to his academic appointment as a Professor within the Department of Criminal Justice. Dr. Rabe earned a PhD in Criminology from the University Delaware, an MA in Criminology and Corrections from Sam Houston State University, and a BS in Criminal Justice from Minot State University. His professional experience includes Executive Director of the Rural Crime and Justice Center at Minot State University (MSU), Department Chair and Associate Professor of the Criminal Justice Center (MSU), Interim Dean of the College of Arts and Sciences (MSU), and Director of the Rural Law Enforcement Education Project at MSU. As Director of the Rural Crime and Justice Center, he was successful in obtaining over $8 million dollars in grants and contracts. Dr. Rabe’s professional memberships and services have included the National Consortium for White Collar Crime Research, the American Society of Criminology, the Law and Society Association, and the Academy of Criminal Justice Sciences. Dr. Rabe has served as a consultant to the Federal Law Enforcement Training Center and the National White Collar Crime Center, and served on the editorial Board for the Journal of Crime and Justice. He was also appointed by the Governor to serve on the North Dakota Commission on Alternatives to Incarceration. His academic areas of specialization include Criminological Theory, Criminal Justice Policy Evaluation, Rural Crime, Criminology, Corporate Crime and Sentencing, Courts, and Sociology of Law. He has co-authored three books and published several book chapters, articles, and technical reports.